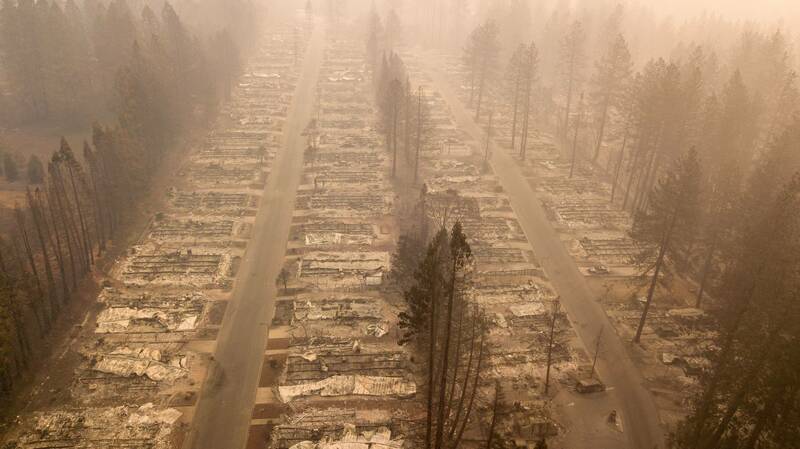 As the Camp Fire swallowed Paradise, as many as 175 elderly patients in skilled nursing facilities lay in its path. Nimble care workers saved them from the flames, wrangling private cars and pleading with ambulance companies to speed safe evacuations. A deadly and growing threat to nursing home patients remains overlooked: extreme heat. Extraordinary, heroic efforts protected patients in Paradise. 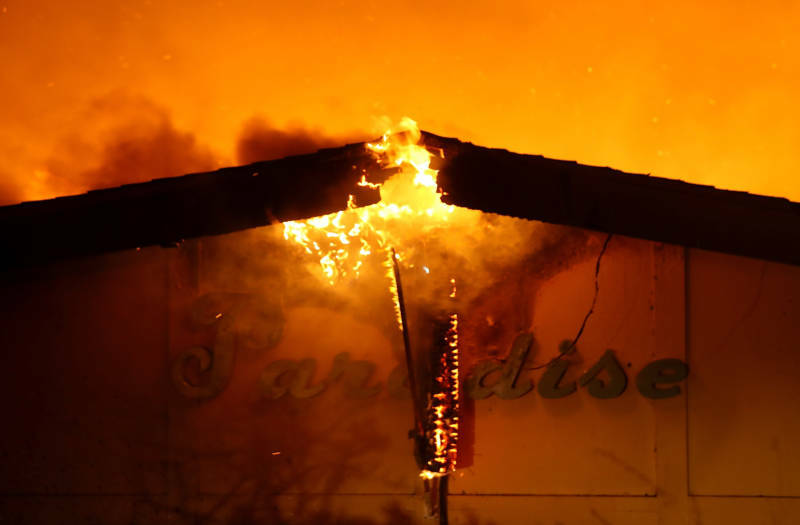 But climate change – which intensifies wildfires and strengthens heat waves and hurricanes – now flings ever-worsening natural disasters at nursing homes in California and across the country. And in some of these cases, managers and staff are failing their patients. In 2017 alone, disasters such as Hurricane Harvey in Texas and the Tubbs Fire in Northern California offered a glimpse of this growing risk, said Deborah Pacyna, director of public affairs for the California Association of Health Facilities, a trade association that represents nursing homes. “It was a wake-up call, definitely,” she said. On the Gulf Coast, excessive heat sickened hundreds of nursing home patients who sheltered in place during hurricanes. In Texas, a group of citizens calling themselves the “Cajun Navy” broke into a nursing home to rescue patients when waters had risen a foot indoors; local police handcuffed one facility manager who refused to permit residents to leave. In Hollywood Hills, Florida, a medical examiner ruled 12 deaths as homicides after a hurricane knocked out power, leaving patients to swelter. In Northern California, recent wildfires are a high-profile example of just how threatening climate-related catastrophes can be for some of these most vulnerable people. But another deadly and growing threat to nursing home patients remains overlooked: extreme heat. In 2000, heat killed two nursing home patients and sent six more to the hospital in Burlingame. Bill Lockyer, who was then the state Attorney General, investigated the first-ever Justice Department prosecution of a national nursing home chain. Temperatures for the sick and dying patients rose, on average, above 106 degrees. In 2006, in Stockton, Woodland and Fremont, nursing home patients died when air conditioning failed during a massive heat wave. Local police evacuated some facilities. A KQED investigation found that last year, extreme heat caused the deaths of at least 14 elderly people, including one 95-year-old woman at St. Francis Convalescent Pavilion, a skilled nursing facility in San Mateo County. That patient, Loraine Christiansen, died from heat shock – and her story suggests that nursing home patients are at serious risk from health care facilities still adapting to climate-driven disasters. A little before 10 p.m. on Saturday, Sept. 2, 2017, a San Mateo County emergency dispatcher picked up a call from a nurse at St. Francis Pavilion. “I just found a patient alert but nonverbally responsive,” the nurse said. The temperature had peaked at 101 degrees that day. It was still 85 when the nurse reported that the patient had turned pale, and had a temperature of 103.1. Christiansen had just been moved to hospice care at St. Francis Pavilion. A widow and former secretary for a Methodist church, Christiansen had hypertension, diabetes and chronic renal disease – all conditions that worsen in heat. Paramedics arrived at St. Francis Pavilion 13 minutes after the 911 call, according to transcripts from San Mateo County public safety communications obtained by KQED. By the time Christiansen arrived in the emergency department at Kaiser Permanente’s South San Francisco Medical Center, her temperature was 106 degrees. According to the coroner’s report, emergency department doctors then simply sought to relieve her pain. Christiansen’s death certificate lists the cause as heat-related shock. 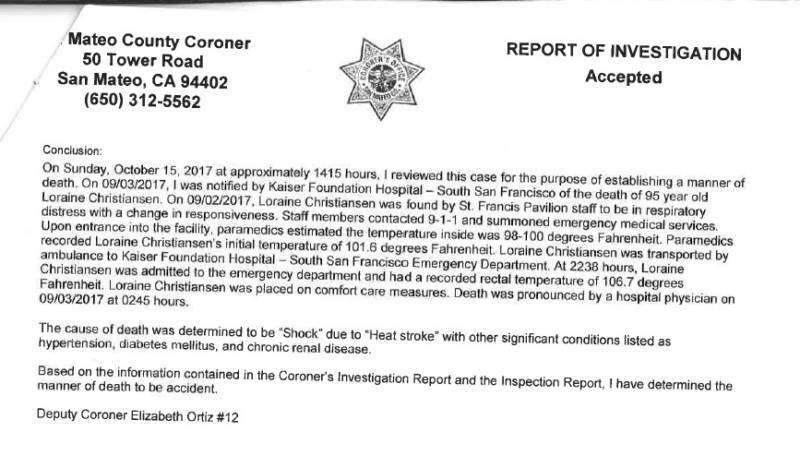 In a report filed with the county, relied on by the coroner in determining the cause of death, one of the paramedics who had attended to Christiansen estimated the temperature in St. Francis Pavilion at 98 to 100 degrees. That’s not supposed to happen in homes licensed to provide care to fragile patients. San Mateo County Coroner's Report for Loraine Christiansen. California law and federal regulations require skilled nursing facilities licensed after 1990 to keep temperatures between 71 and 81 degrees. In older facilities, such as St. Francis Pavilion, the temperature simply has to be “comfortable and safe.” Violating these standards carries penalties up to $25,000 or more if the California Department of Public Health determines that the conditions led directly to a patient’s death. St. Francis Pavilion’s administrator, Timothy Caslmon, did not respond to calls and emails between September and November. Calls to the main number for Generations Health, the facility’s Orange County-based management company, were directed back to St. Francis Pavilion. The California Department of Public Health officially learned about one death at St. Francis Pavilion, possibly Christiansen’s (the individual is not named) through a complaint related to heat. In a 2018 document stating the agency’s results in the case, CDPH said it was "unable to substantiate” any federal or state code violations stemming from the death. The night Loraine Christiansen died, overnight temperatures hovered in the 80s, and St. Francis Pavilion has no air conditioning to offer relief indoors. Even after paramedics rushed her to the hospital, a fire truck stayed behind, working out a plan to cool the facility. Firefighters had one industrial-sized fan called a blower, used at major fires to repel smoke and gas. But one wasn’t enough. It would take at least three. On emergency communication channels, Daly City Fire Captain Joel Abelson, on Fire Truck 95, asked Engine 91 for assistance. 'Yeah, 91, if you could stop by Station 95 and pick up the electric fan that’s in our back bay, we’re going to need both electric fans. On that busy night, Daly City’s only ladder truck, and two out of five of the city’s fire engines, labored for hours at St. Francis Pavilion. A person who was inside the facility and who spoke on condition of anonymity described firefighters moving through the 239-bed facility, using fans to blow hot air from one part of the facility to another, and eventually outside. Later in the weekend, San Mateo County Adult Protective Services visited St. Francis Pavilion, watching as staffers handed out popsicles and ice. Care workers told a government employee without authority to speak to the media that they tried to buy fans, but nearby stores were sold out. Instead, the staff gathered residents who were mobile into the coolest room they could find. Report from North County Fire Authority about conditions found at St. Francis Pavilion, in response to a 911 call from a facility nurse, on September 2, 2017. KQED twice requested an interview with CDPH. The department offered a general statement, but refused to comment on reports of excessive heat at St. Francis. The department wouldn’t say whether or not it is investigating any other heat-related violations from that 2017 Labor Day weekend. “Details about ongoing investigations are confidential until the investigation is complete, and findings are issued to the facility,” said CDPH in an email. Since the 2017 Labor Day heat wave, new regulations have taken effect in California that require St. Francis Pavilion and other facilities like it to be ready for emergencies, whether evacuating or sheltering in place. According to CDPH records, in December 2017 an inspection concluded that St. Francis Pavilion lacked an effective emergency preparedness plan, and had neither policy nor procedures in place to protect people sheltering in place during a disaster. The facility’s administrator said during that inspection that “he was not aware of this requirement of the emergency preparedness plan.” St. Francis updated its plan by January. St. Francis Pavilion isn’t alone. NPR’s Jordan Rau wrote last year that more than half of California’s nursing facilities have been cited for failing to train workers what to do in an emergency or for failing to have a plan. That includes skilled nursing facilities in Paradise, surveyed earlier this year by CDPH. In February, investigators found that the 136-bed Cypress Meadows hadn’t done all of its required emergency preparedness work, including a drill. And CDPH found that the 99-bed Pine View Center hadn’t done a risk assessment for disasters or drills for emergencies, and that its manual alarm boxes and sprinklers weren’t correctly maintained. All of the problems were corrected within weeks, well before the Camp Fire. The California Association of Health Facilities has offered support to nursing facilities, with model emergency plans, training modules, and an app to promote emergency response. The trade group sometimes lobbies against new legal mandates, but its disaster response manager, Jason Belden, said he believes new regulations have encouraged better preparation – including in Butte County last month. Loraine Christiansen’s death in a Daly City nursing facility comes after years of warnings about heat-related illness in California, and after poor planning in other states endangered hundreds of patients who sheltered in place during hurricanes last year. Stories of those vulnerable Gulf Coast patients prompted an investigative report from the Democratic staff for the U.S. Senate Committee on Finance. Released this year, the report concluded that better emergency planning is crucial and that heat rules in particular should be re-evaluated. But the Trump administration is considering weakening the requirement that facilities update emergency response plans annually; the proposal from the Centers for Medicare & Medicaid Services would require updates only every other year. Every licensed care facility in California is required to plan for emergencies. And climate change raises real questions about how ready our healthcare system is for more frequent hazards, said Linda Rudolph, who directs the Center for Climate Change and Health at the Public Health Institute, a nonprofit group in Oakland. We don’t have that now, she said. 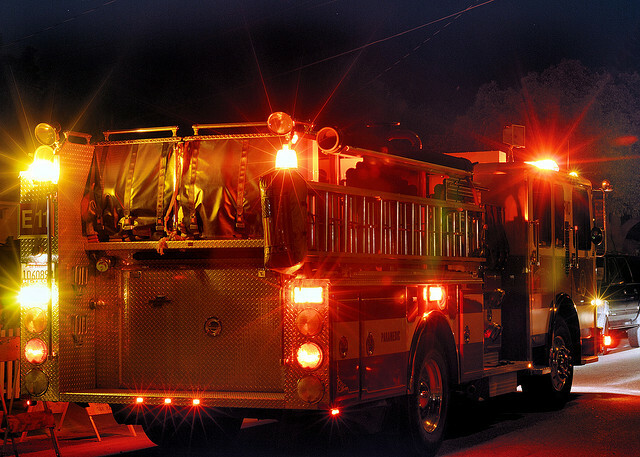 Pat McGinnis, executive director of California Advocates for Nursing Home Reform, agrees that developing a solid emergency response plan is ever more crucial now: Fast-moving fires don’t leave much room for error. Nor do intensifying storms or excessive heat. Editor's Note: This reporting was supported by a grant from the USC Annenberg Center for Health Journalism Impact Fund.